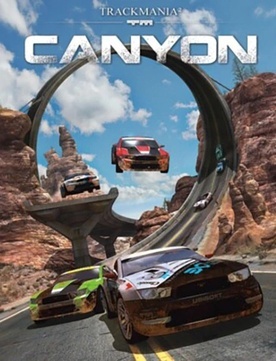 TrackMania 2: Canyon is the follow-up to the popular online ranking racing game TrackMania United Forever. The game boasts a worldwide ranking database that keeps track of your skills globally, as well as your rank by country and state, complete with a built-in track editor that allows you to create and share your tracks with the massive online community. The same solid game play remains intact as well, challenging the most competitive racers yet simple enough to hook casual gamers. The solo mode has 65 tracks that get progressively harder, though not all of the tracks are available at once. You have to unlock tracks by earning bronze, silver, and gold medals based on your track time. The tracks are separated by five difficulties: White, Green, Blue, Red, and Black. You cannot play any of the tracks in Black until you have gold medals on all of the other tracks. When playing in solo mode, you have to choose which medal (time) you want to aim for and as you race you'll see your competition, or even a shadow of your last performance, to race against. Online lets you race for five minutes, and the best times will be ranked in first, second, or third place. You can drive through your opponents so you don't have to worry about crashing into them, just the obstacles on the race track. You can also press "O" to remove your opponents so you don't have to see them. Strong Points: Simple and fun racing; easy track editor. Weak Points: Unstable joystick support. There are plenty of active servers, and finding an online match to join was pretty easy to do. There are multiple game types including stunt mode, but time attack seems to be the most popular. The maturity level is refreshing and the players are courteous but competitive. I didn’t see or hear any foul language (I don’t think there is native voice support) and the upbeat background music is pleasant to listen to along with the realistic audio from revving engines, shifting gears, and the crunch of metal when you crash into walls or other obstacles. The race tracks vary between paved and dirt roads, as well as the tracks' width and turns, some of which may send you tumbling off of a cliff. There are both day time and night time races. Thankfully, the weather is always nice. Many of the tracks are straight forward with some sharp turns, but you’ll often encounter speed arrows as you jump over cliffs, race along walls, or go through loops and narrow tunnels. The camera is normally behind your race car, but when you are doing loops, the camera view will sometimes automatically change to first person view. It takes some getting used to, and can be a little annoying at first. Fortunately, it does change back after the loop is completed. There are three camera views: default is behind the car, another is farther away along with a cockpit view. The cars are more detailed this time around, and they can take damage in this game. Even though your car gets crinkled up, it amazingly seems to race just fine. The physics are also hit or miss this time around, though launches and jumps seem to be pretty accurate. However, there are times when the car seems to be underweight and hovering instead of driving. My biggest complaint is that my Microsoft Sidewinder joystick is unusable. It's detected and the force feedback works, but the game is incredibly unstable with it plugged in. I had no issues with the original TrackMania. I have yet to try a gamepad, but the keyboard controls seem to do the job. The keyboard controls are incredibly simple. You just use the arrow keys to move, and when you mess up, press enter to start from your last checkpoint, or backspace to restart the race. And if you're like me, you'll be hitting the backspace button A LOT. The goal is to complete the track the fastest. It's nice to not have to worry about crashing into or avoiding other cars. I love the simplicity and I am humbled by the ranking system. I never claimed to be a good racer, but this game makes it woefully obvious that I'm not. While many of the tracks are fun, there are a few where I'm happy to accept a bronze medal, and I don't plan on going back to improve on it anytime soon. Regardless of my gaming style, I highly recommend this game for any racing enthusiast or casual gamer. The $25 price tag is reasonable, and with the active online community and ability to create and share race tracks, there's plenty of fun to be had.